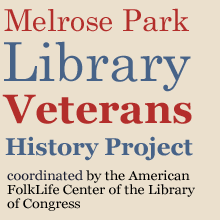 Welcome to the Melrose Park Public Library's Veterans History Project, in conjunction with the Library of Congress Veterans History Project. The Veterans History Project honors American war veterans and civilian workers who supported them by preserving stories of their service to our country. This is a project of the American Folk Life Center of the Library of Congress. "The US Department of Veterans Affairs provides patient care and federal benefits to veterans and their dependents. The home page for the Department of Veterans Affairs provides links to veterans benefits and services, as well as information and resources for other Departmental programs and offices." Find out more about the Veterans History Project or visit the official Veterans History Project, coordinated by the American Folklife Center of the Library of Congress.